Some believe Kanbun Uechi was born in Izumi on the Motobu Peninsula, and that he moved to the tiny mountain village of Takinto at three or four years old. However, evidence clearly indicates that Kanbun's parents, Kantoku and Tsuru Uechi, had already moved to Takinto and it was in the mountain top village that Kanbun was born on May 5, 1877. Kanbun Uechi grew up in this area, part of a proud, traditional Okinawan family of bushi (Samurai or Shizoku) lineage. The Uechi family farmed daikon radishes and sold them in the village at the bottom of the mountain. Radishes are still grown there today. Empty handed Okinawan fighting arts (te), kobudo, and the samurai arts were a cultural part of rural life in Okinawa, especially on the Motobu peninsula. More organized martial arts were being taught in the southern areas such as Naha, Shuri and Tomari. Those systems were greatly influenced by the martial arts of China (tote). Areas in the southern part of the island were an insurmountable distance for a farmer from Motobu to travel. Kanbun learned bojutsu (staff arts) from exposure to Motobu experts such as Taru Kise and Kamato Toyozato as well as his father, Kantoku. Kanbun often taught the younger people of his area and led bo demonstrations that accompanied holidays and festivals. An aged martial arts master from Tobaru named Toyama instilled in Kanbun the desire to pursue martial arts training in China. Toyama had visited China many times to study the martial arts and bojutsu. Though he did not leave a lasting historic mark on Okinawa,Toyama influenced many young men in the Motobu peninsula, including Kanbun Uechi. Kanbun's keen interest in karate and social objections to serving in the Japanese army provoked his decision to leave Okinawa. His parents abandoned their earlier objections against Kanbun traveling to China in the interest of their son's safety and life. In March 1897, Kanbun undertook the ten-day excursion across the East China Sea to Fuchow City in Fukein Province. He was accompanied by Tokusaburo Matsuda, a friend from Motobu. The two young refugees, soon to be twenty years old, were uneducated and unfamiliar with the language and ways of China. Seiko Toyoma told this version of Kanbun's acceptance into Shushiwa's school: One day Shushiwa became ill with a massive headache. He did not look well so his alarmed students sought out Kanbun Uechi and insisted that he use his medicine to cure their teacher. Kanbun successfully healed Shushiwa with herbal mixtures. As a result Kanbun Uechi was finally accepted as an official disciple at the Fu Chuan Shin Temple in a secret ceremony called Pai Soo. Like many would-be martial arts students in the last days of the 19th century, Kanbun Uechi's first years of study were as much about patience as about martial arts! The first three years of Kanbun's training were devoted only to the kata Sanchin. During the first two years, training focused on strengthening the student's body through hard work as well as martial arts practice. In addition to karate training, Kanbun worked at farming on the temple grounds, pulling up daikon radish roots. Another chore he performed was the cleaning and husking of beans. The beans were placed in a large stone bowl and struck repeatedly with the fingertips until the husks could be blown away. With this type of work the fingertips were being trained for martial arts. In Okinawa and China, building strength in daily work and karate training were closely related. In the spring of 1904, the same year that war began between Japan and Russia, Kanbun Uechi received the Menkyo Kaiden certificate naming him a master of Chinese Pangainoon (half hard-half soft style). It was a monumental event in his twenty-seven years of life. He had vowed to himself to become proficient in the martial arts of China or never return to his homeland. Kanbun became an assistant to Shushiwa, continuing his martial arts training and lessons in Chinese literature and medicine for three more years. Kanbun felt a strong obligation to perform and teach Pangainoon precisely as Shushiwa taught him. He was diligent about every aspect of his teaching. Kanbun had learned a great deal about the language and herbal medicine by that time. The knowledge of growing, preparing and administering herbal medicine went hand in hand with martial arts teaching. A teacher was expected to heal his students when they were injured during training. At thirty years of age, Kanbun opened his own dojo, the Pangainoon Kempo Sho (Martial Arts Institute) early in 1907. He chose a town he liked called Nansei no cho (Nansoe), approximately 250 miles southwest of Fuchow. Kanbun Uechi was a warm hearted, affectionate man who was well like by his students. His fierce martial arts ability was secondary to his easy, likable demeanor. Though now teaching in his own dojo, Kanbun continued his instruction by making semiannual visits to Shushiwa to continue his own dedicated training. Kanbun Uechi, despite requests from his students and Shushiwa to remain, closed his dojo in 1910 and left China forever. During his thirteen years in China, Kanbun learned three kata. They were Sanchin, Seisan, and Sanseiryu. Kanbun called the third kata Sandairyu. Kanbun also learned various methods of Chinese body conditioning. Having satisfied his goal of learning Chinese martial arts, Kanbun returned to his homeland of Okinawa. Not long after arriving back, Kanbun Uechi began to receive requests to demonstrate his formidable and notable martial arts skills. He was also frequently asked to teach both formally and informally. The constant pressure to teach karate made life difficult for Kanbun Uechi, who sought only seclusion. Eventually, the pressure to teach became so intense that Kanbun had to act. At that time, Okinawa was undergoing serious economic strife. The pressure to teach and the severe economic climate combined to help him make a difficult decision. Kanbun again left his homeland. He followed the lead of many Okinawan people seeking employment during this time and at forty-seven years old decided to travel to the industrialized area of Kansai (Osaka and Kobe), Japan. Kanbun eventually traveled to Wakayama and secured employment in a textile mill, the Hinomaru Sangyo Kabushki Kaisha. The large mill, made of red tile called akarenga, produced boseki fabric used in Japanese clothing. The factory operated twenty-four hours a day. In April 1925, Kanbun ended his fifteen-year ban on teaching martial arts and opened his first school in Japan. It was at this point that Uechi ryu, taught as Pangainoon, was born. Kanbun used the living quarters (taku) in the company (kai-sha) compound for this purpose, naming it the Shataku (company quarters) dojo. "Dojo" is the name for a karate school. The words literally translate to "way place" and represent the place where the way of karate is taught. Kanbun intentionally limited the number of students he taught. New students had to be recommended by one of the original members. That member guaranteed the moral character and behavior of the candidate they recommended. All prospective students were carefully screened and scrutinized by Kanbun. All students were forbidden to display their martial arts outside the dojo. All training was conducted secretly behind closed doors and shutters. In March 1932, Kanbun Uechi, at fifty-four years of age, changed the location of his dojo. He opened the Pangainoon-ryu Karate-jutsu Kenkyu-jo in the Tebira section of Wakayama. The new dojo, located at Showa Dori (street), less than two miles from the former Shataku dojo, was dedicated to formalized training and personal development. 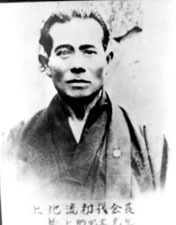 Gichin Funakoshi, who is generally credited with being the fist Okinawan to open a dojo in Japan, opened his Meisei Juju dojo in Koishigawa, Tokyo two years later in 1934. The clandestine atmosphere of the Shataku dojo was left behind and the new dojo was open to the public. Kanbun continued to screen potential students. Only persons of an unbalanced or deceitful nature were excluded. The student enrollment grew and Kanbun soon quit his job at the boseki factory. Due to post war strife in Japan, Kanbun decided to return to Okinawa. In October 1946, Kanbun Uechi, accompanied by students Seiryo, Tsuru, and Seiyu Shinjo, Seiko Toyama and a few others, returned to Okinawa together. Several others later returned separately and settled in the northern portion of Okinawa. Kanbun left the Tebira dojo in the care of Ryuyu Tomoyose. In January 1948, Kanbun Uechi became ill with nephritis that he fought for eleven months. Kanbun, 71 years old, died on Ie-jema Island on November 25, 1948. The Shinjo family were the only ones present when Kanbun died. Kanbun Uechi has been described by many people who knew him as a kind, gentle, quiet man in day-to-day life but a fierce, intense, and strict instructor of Pangainoon ryu. His life was as unique and eventful as other forefathers of karate, as was his influence.